SAP R/2 was the first highly stable solution released by SAP. “R” stood for real-time data processing and “2” stood for the two layers: presentation + integrated application & database. This was in late 70’s, when companies were running their business applications on mainframes, and R/2 was apt with the existing technology. SAP R/2 marked the first generation of SAP’s business solution. Then came SAP R/3 in the 90’s, capitalizing on client-server architecture. “3” signified the three layer architecture (database, application and presentation). The separation of application layer from database layer reduced the load off database and helped improve the overall performance of the solution. This was immensely popular (second) generation of SAP’s business solutions. One can attribute the success to Y2K and SAP R/3 fitting the business needs of most organizations looking to dodge Y2K paranoia. 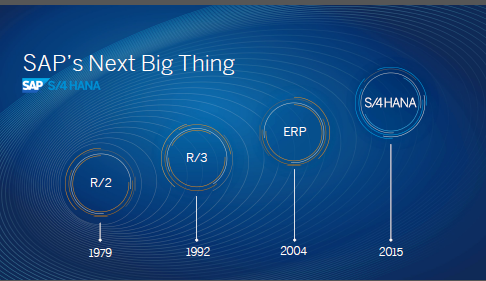 SAP was riding the wave of Y2K-led-success while the dot com bubble of the late-90’s slipped past them. They joined the the web technology a bit late with the release of SAP Web AS or NetWeaver (refrigerator). Their third generation business solution-SAP ERP, which was based on Web AS, was released in 2003-04. SAP has been supporting multiple database vendors. SAP applications and data models were designed keeping the abilities of those popular database vendors in mind. The core SAP application was not optimized for a single database software. This has changed with the 4th generation. The data model is simpler now and is optimized for SAP HANA. SAP is moving towards a new paradigm as it has always done in the past. A lot of changes this time. For example: tables like MARA that have been around since R/2 days will not continue to exist on S/4HANA. SAP GUI may be phased out, it’s all on Fiori. New innovations will not happen around AnyDB (non-SAP databases), it’s all on HANA. There won’t be separate transactional and analytical systems.